Angelo “Lo” Roman Lafitte was taken into custody by STPSO detectives in Slidell Tuesday afternoon without incident. Lafitte will be transported to the St. Tammany Parish Jail, where he will be booked on the charges listed below. 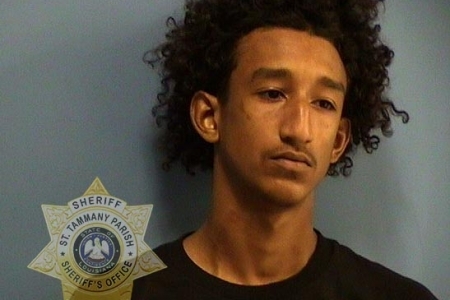 A 22-year-old Slidell man is wanted by the St. Tammany Parish Sheriff’s Office following a shooting that occurred at approximately 11 p.m. Sunday night (Feb. 3) on Laurent Road. A 16-year-old male was struck in the hip and is in guarded condition at an area hospital following the incident. Angelo “Lo” Roman Lafitte (DOB 12/04/1996) is wanted for L.R.S. 14:34.7 Aggravated Second degree Battery, L.R.S. 14:37.4 Aggravated Assault with a Firearm (5 counts), and L.R.S. 14:79 Violation of a Protection Order. Lafitte had provided a group of individuals with an address with plans to meet after he and one of them had exchanged threatening messages via social media. As the group drove down Laurent Road, Lafitte fired multiple shots at the vehicle, one of which struck the victim, who was a passenger in the vehicle. The driver drove to a nearby residence, at which time, 911 was called and STPSO deputies responded. Warrants were issued Monday afternoon (Feb. 4) for Lafitte’s arrest. He is also wanted on unrelated warrants for L.R.S. 14:56B(2) Criminal Damage to Property $1000-$50000, L.R.S. 14:35.3D Domestic Battery Second Offense, and L.R.S. 14:79 Violation of a Protection Order. Anyone with information about Lafitte’s whereabouts, is asked to call the St. Tammany Parish Sheriff’s Office at (985)898-2338.